How did Volvo's Swedish touring car racing team end up as a high performance manufacturer under their own brand? It didn't happen overnight. With Polestar announcing their very first production vehicle – an incredible 600HP hybrid coupe – in 2017, we got to wondering. How did this once-time Volvo racing team end up as a high performance manufacturer under their own brand? Is there Polestar history? Oh yes, there is Polestar history. But it didn’t happen overnight. Polestar’s been around since the mid-90s, working with Volvo from the get-go. But before we get into all that, what exactly is Polestar anyway? As of 2018, Polestar is Volvo’s performance arm, providing tuning and performance upgrades for both existing Volvo models as well as new offerings. You can either buy a Polestar Volvo new, or bring in your existing vehicle to your dealer for an upgrade. … [the team owner] changed the name to Polestar to “represent the frozen north of Sweden with the pole star and also playing on the connection to pole position and star of racing”. These tunings take about an hour and can give you quite a whopping of extra power. Bring in your 2006 XC70, for instance, and gain an extra 28 HP and 36 lb-ft of torque. Not bad for an hour wait! In 2017, Volvo purchased outright the tuning and performance arm of Polestar and decided to spin off the brand as a separate manufacturer to produce high performance electric vehicles. Before all this performance manufacturing and engine optimization though, Polestar was simply Volvo’s team in the Swedish Touring Car Championship. While founded as an independent company, Polestar has always been linked to Volvo. In 1996, the Swedish Touring Car Championship celebrated its inaugural year, and driver Jan Nilsson founded the company to join in on this new racing series – with a Volvo 850. Let’s take a look back at how Polestar morphed from this racing team to a premier electric vehicle manufacturer. Jump back to 1996 and the British Touring Car Championship was hot. The sport was huge in Sweden and Volvo even had a great showing the year before in Volvo’s new BTCC 850 wagon. Wanting to cash in on the popularity, the Swedish Touring Car Championship was formed. Seasoned Swedish driver Jan “Flash” Nilsson, who previously raced in Formula Ford and Formula 3, founded the company Flash Engineering to compete in the new series. Flash Engineering was the official Volvo team in the STCC, with the manufacturer providing funding and vehicles. That inaugural year, Nilsson – the team’s sole driver – drove the Volvo 850 to 1st place. The following year, Nilsson – again the team’s lone driver – jumped back in the Volvo 850 and again secure 1st place. Over the next 6 years, he would also go on to bag 4 2nd place wins in 1998, 2001, 2002, and 2003. Fast forward to 2004 and Nilsson has sold his half of the business to Christian Dahl, who joined Flash Engineering as their chief mechanic back in 2001. The following year, Dahl changed the name to Polestar to “represent the frozen north of Sweden with the pole star and also playing on the connection to pole position and star of racing”. In 2006, Polestar began to branch out from racing, partially taking over Volvo training for new mechanics and even creating training equipment for mechanic schools. In 2007, they further developed the program, supplying Volvo cars to schools and helping introduce new business methods to dealers. Of course, Polestar was still heavily involved in racing. For the 2008 STCC season, Volvo asked Polestar to develop the new C30 from into a race-worthy vehicle – Polestar’s first chance to design and build a car completely from scratch. While the team didn’t break any records with the C30 for the 2008 season, this new vehicle ushered in a new era for Polestar’s relationship with Volvo. 2009 really marked a sea change for Polestar’s business focus. Driver Robert Dahlgren won the driver’s championship in the C30, with Polestar winning the team championship the following year. Polestar also became Volvo’s official performance partner in 2009 and, for the first time, left the racetrack, designing and manufacturing performance upgrades for ‘civilian’ Volvos. On top of all this, they also began producing concept cars based on the C30 and S60, with 100 tuned S60 eventually going on sale in Australia in 2013 – Polestar’s very first production vehicle sold to the public. That same year, a tuned version of the C30 also hit the market. Polestar continued to race in the STCC and even went international, jumping into the World Touring Car Championship in 2011. Polestar will now produce high performance electric and hybrid vehicles. Polestar vehicles will now be branded solely under the Polestar brand – not Volvo. With these changes, Volvo hopes to compete with other high-performance electric vehicles, notably Tesla. The first vehicle directly branded as Polestar, the aptly named Polestar 1 or P1, will be available in 2020 only via a subscription service. As promised the P1 will be a serious contender in the performance electric industry, pumping out 600HP via the hybrid engine, with an all-electric range of 93 miles. After the P1, all models will be fully electric, with the Polestar 2 a mid-sized sedan and Polestar 3 an SUV. What happened to Cyan Racing after Volvo split Polestar in two? Well, they’re still going strong! As mentioned, they’re still an official motorsports partner of Volvo and they’ve branched out since the split, going international for the World Touring Car Championship. For the 2017 WTCC season, the 3-person Cyan team drove Volvo S60s to first place overall in the championship. What Volvo Models Has Polestar Tuned? As of 2018, Volvo offers Polestar upgrades for many of their models, though offerings differ by year and country. Upgrades are typically available for vehicles manufactured in 2006+ and bump power and torque by about 30 HP and 30 lb-feet respectively. While prices vary from dealer to dealer, these tunings typically fall around $800 to $1500. As of 2018, Volvo also offers Polestar versions of the S60 and V60. These Polestar variants aren’t simply the normal models with the tune already in place. Of course, they do have the tuned engine, but also an optimized powertrain, stiffer suspension, upgraded brakes, wheels and tires, and sportier styling. In 2016 Volvo pushed the Polestars into the controversial Drive-E 4-cylinder world, axing the tried/true inline 6 cylinder for the now-ubiquitous inline 4. Now that you know pretty much everything you need to know about Polestar, maybe you’re wondering about Volvo’s other motorsports attempts? Most of us are probably already aware of Volvo’s motorsports history, but it’s the 850 (including the wagon) in the British – not Swedish – Touring Car Championship that most of us picture when we think about blurry Volvos at high speeds. Did you know that, even before the 850s cruised through the BTCC in the 1990s, rally drivers had been using Volvos as far back as the 1920s? Ever since their first car came off production, rally drivers have picked the reliable, sturdy Volvo for long, harsh races. In 1928 – just 2 years after the first Volvo came off production – three of these vehicles entered in the Swedish Royal Automobil Club’s Winter Rally – a grueling 652 mile race with snow chains and no helmets. While no Volvo won the race, two placed 6th and 3rd – not bad for a two year old car company. A year later, 2 drivers entered a Volvo OV 4 in the Moscow-Leningrad-Moscow Rally. This 845 mile race obviously required snow chains, which was certainly a strange sight on a convertible vehicle with no heat! Amazingly, this drop top won first in its class that year. Jump to 1949 and Hilding Olsson, a Volvo dealer himself, drove a Volvo 444 in the Monte Carlo Rally. He certainly didn’t win, coming in 100th place, though still ahead of 66 more drivers. Unfortunately, in 1966 two Volvo mechanics died from a truck crash at the Acropolis Rally and Volvo subsequently pulled out of all racing due to safety concerns. However, they weren’t gone for long. After a quite decade in the 1970s, the company reentered the racing scene in 1980, winning the European Rallycross Championship that year with the Volvo 343 and again in 1987 with the legendary 240. In fact, from 1980 to 1986, they placed 2nd or 3rd in each season of the European Rallycross Championship– mostly with the 240. Beyond the Swedish Touring Championship of which Polestar was so involved, Volvo dominated the British Touring Car Championship through the 90s, eventually winning the cup in 1998. Even before then – as most of us know – Volvo was involved with touring, winning the European Touring Car Championship in 1985 with the “Flying Brick” – the same 240 Turbo that landed them the rallycross championships above. The 2.1 liter engine in that 240 pushed out at incredible 300 HP, with a top speed of 161 MPH. With the 242 Turbo, Volvo also took home 1st place in the 1986 Australian Touring Car Championship. 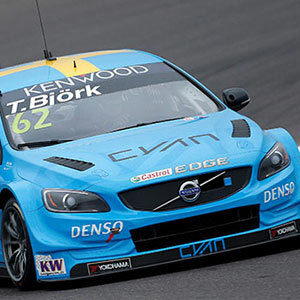 Jumping back to Polestar and the Swedish Touring Car Championship, Volvo/Polestar won the 2009 STCC with the C30. In 2017, Polestar (now Cyan Racing) won the World Touring Car Championship with the S60. Volvo has – quite literally – been racing since its very inception in the 1920s. From poorly-equipped convertibles on the snow-covered roads of Russia all the way up to the modern S60, Volvo’s put wheels on the track. And with Polestar such a crucial partner in their more recent history, it’ll be interesting to watch where Volvo’s motorsports teams move in the future. With Cyan Racing’s great showing in the 2017 WTCC, it seems pretty promising. Discussion taken here. Please join in! With Polestar announcing their very first production vehicle - an incredible 600HP hybrid sedan – in 2017, we got to wondering. How did this once-time Volvo racing team end up as a high performance manufacturer under their own brand? Well, it didn’t happen overnight. Polestar’s been around since the mid-90s, working with Volvo from the get-go. But before we get into all that, what exactly is Polestar anyway? Next PostNext MVS Newsletter: January 2018 Volvo News!